This value pack contains three BX-1 magazines. 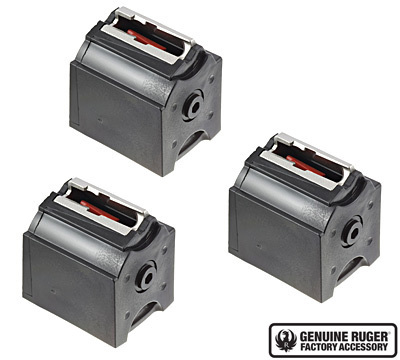 These 10-round, .22 LR caliber magazines are made of black plastic with steel feed and work with any factory original 10/22® Rifle, SR-22® Rifle, 22 Charger™ Pistol, .22 LR Ruger American Rimfire® Rifle and .22 LR Ruger 77/22® Rifle. *Due to changes in the law effective October 1, 2013 Ruger is not able to sell magazines to CONNECTICUT residents. Ruger cannot bill to or ship this magazine to the Bronx, Brooklyn, Buffalo, New York City, Queens, Rochester, and Staten Island, New York. DO NOT ORDER THIS PRODUCT, if you live in these cities. These WILL NOT work with this rifle, they are to short. Work very well no problems. Cant beat em. Pairs perfectly with the Allen gator trimag and a 3 pack of dust covers for safe keeping. I received a Ruger 10/22 TD as a gift and subsequently purchased the 3-pack BX-1 mags, and Im completely satisfied with their performance. Function perfectly - just like this type of magazine always has.